Spirituality takes the form you build for it out of your own desires. The only thing we receive from Above is an informational record, a Reshimo, but then we have to build the form ourselves. In addition, if we request it, we also receive from Above the strength and the intelligence to implement this. Some people think that a ready-made world will suddenly come tumbling down on them from Above. But it’s pointless to wait for this to happen. We have to build the spiritual world through our own efforts. We have to draw this world ourselves on the background of the Light. To the extent I make efforts, I draw the image of the Upper Level and it gradually becomes truer. I do everything in my power, such as imagining various forms. Sometimes I am better at it and sometimes worse, and sometimes I am mistaken. I create them and erase them over and over again until I achieve success. In the process of this work, I suddenly see that the Upper Level begins to help me! It clothes into me like a hand in a glove, and works there. It helps me like a mother playing with her child, helping him to build a house out of Lego pieces. When I try to do something, and succeed, I suddenly feel that it is the Upper Level that helped me understand the proper way to do something, and that it was not the way that I thought was right. The way to build the place where the Creator will be revealed is by building a connection with our friends. We thus build the “picture of the Creator” by using our own matter. Without this, He has no image. I project Him onto myself, onto my own desires, onto the part of me that I can make similar to Him. Below are the lessons I gave at the Congress held this past weekend in Buenos Aires, Argentina. The lesson is like a train that we have all boarded together. The final destination is the spiritual world. A question I received: According to Kabbalah, humanity’s correction takes place over six thousand years. Most of this time has already passed, and there’s just a little over 200 years left. Why have we begun to use Kabbalah for correction only now, at the very end of the allotted time period? And even now, many people still don’t have any idea about this teaching. It seems that the world will end up reaching correction through great suffering. Why did the Kabbalists begin to put so much effort into teaching and disseminating Kabbalah only in the “final minutes” of correction? My Answer: It is because the world has only now reached its maturation, as Kabbalah predicted. The reason for this is that the most important aspect of spiritual actions is the preparation, which depends on a person and occurs inside him. This is also why it takes so long. However, the act of correction itself happens quickly because when a person is influenced by the Upper Light and the revelation of the Creator, he changes instantly. Try it for yourself! Therefore, the remaining 230 years is more than enough. And if we’ll want to, we will be able to reduce this time. A question I received: You have said that in our generation, egoism has grown so big that the common soul had to divide into seven billion parts in order to be corrected more easily. Then how is it possible that a war could eliminate a large portion of the population? According to the first point made, one survivor could not handle the egoism of several souls. Laitman.com Post: Why Are There So Many People In The World? A question I received: Sometimes in life there are those rare moments when you feel that everything around you is permeated by a special force, enveloping you with kindness and filling the whole world with love. This sensation is the most intense pleasure you have ever felt. And you know there’s a line of people extending across the whole world waiting to feel this pleasurable sensation. And if all this is just a microscopic part of what one feels when ascending to the very first spiritual level, then is it even possible to bear that kind of pleasure? I myself have had an experience like this, and I can’t imagine how you can possibly have room for anything more inside your feelings. My Answer: Of course you won’t be able to bear it! Say you are about to win the lotto with a prize of a million dollars: your heart would just burst, because we are equally impressed by the bad things and the good. You feel good up until a certain point, but once you pass that limit, you have “too much of a good thing” and the experience becomes too intense for you. This happens because our abilities to feel are very limited and we have to expand them. We have to feel eternity, perfection, boundlessness, and infinity – in every sense and from every perspective. Every person in the world will have to feel the Creator fully and entirely. Every one of us will have to feel all of the Creator’s might and scope, to experience His entire program and inner abilities. One needs only to learn how to do this correctly. Right now we all receive egoistically, and therefore we constantly keep destroying our desire, and it always disappears. Say I enjoyed something for a moment, but then the pleasure disappeared. It may have lasted for several minutes, hours, or even weeks (if the thing I received was really big – such as a new home or an exciting trip). But eventually, everything ends and disappears. We have to build a Kli or desire that will be eternal and not disappear. The Creator wants just one thing from you: to learn to enjoy, so you will feel pleasure from everything, even from this earthly life. You don’t have to restrict yourself in any way or be a hermit. The pleasure you will feel will continuously grow and get bigger. To do this, you must only study all of nature (including this world) and discern how you can feel that pleasure. But this is something we don’t know! It’s a fact that we have lived in this world for many thousands of years, and we still haven’t learned to derive pleasure from it. We only feel more and more miserable with time. At the end of the day, what does an intelligent person want from life? To enjoy it! And he cannot do so even in this small, earthly life. And he isn’t learning how to, either! He is only making his life worse and worse. But at the end of all our attempts, when we grow completely disillusioned with everything, the science of Kabbalah comes to us and teaches us how to enjoy. Just think: how much pleasure can you actually take in? You’re like a child who dreams about a carton of ice cream, but in reality he isn’t able to eat more than three servings. So it is with you: you received a small spiritual glow, and you can’t fathom how anything more than that is possible. But the smallest spiritual level is billions of times (or even a billion to the billionth power) greater than what you felt at that unusual moment, when spirituality became slightly revealed to you. In the News (from Rasmussen Reports): The Rasmussen Reports daily Presidential Tracking Poll for Monday shows that … 40% Strongly Disapprove [of the way that Barack Obama is performing his role as President] giving Obama a Presidential Approval Index rating of -12. My Comment: Yet, the crisis is still ahead, and Mr. Obama does not have answers to it. The new administration will lead to a degradation of morals in America, and that, together with the crisis, will cause terrible consequences… until the people will reveal the method of correction, Kabbalah. Out of all reality, I perceive only the things that are worthwhile for me, from the standpoint of profit or loss. Everything else I do not perceive. I may be surrounded by thousands of other things, but I remain indifferent to them all. And if I am indifferent, I simply don’t see them. Then you will truly sense the world outside yourself, and exist in the World of Infinity. But where is this World of Infinity? Is it behind some star or galaxy? No. It is here and now. An editorial in the news (translated from blog.liga.net): Even supposing that the crisis will soon be over, there still won’t be enough work for everyone. People are buying fewer products because they have less money, and in addition, a person without work is a dangerous thing. The only solution is for people all over the world to change their value system and their notions of what they are willing to pay money for. The crisis is making us realize what is of true value in the 21st century. It is preparing us to change our life values, and to understand the new values for which we are willing to pay money. If the world’s richest people were to gather and form a world government based on these new values, then the world structure could change. But apparently, such an intent cannot appear without a crisis. People’s consciousness doesn’t change in conditions of comfort. Stress, or a crisis, is necessary. Everyone needs it – whether they are workers, the middle class, retirees, or homeless – in order to ask themselves the main question: What are the new values that are important to me today? I have yet to find one person who could give me a straight answer of what to do. Managing the crisis lies not in changing the situation in the external world – since all of this is just vanity of vanities, but the change needs to occur in the human consciousness. That is where all the roots and causes are found. My Comment: People are already guessing that the crisis is not in finance, but in the need to change our general attitude toward life, ourselves, the world, and Nature. The problem is that we understand that we need to change, but we don’t know how and what to change, and we won’t find these things out by ourselves. We will keep receiving blows, but we won’t know how to evade them correctly. Nature demands that we rise to the “human” level, which is a level we know nothing about because its qualities are opposite to our current level. We will develop and eventually recognize the evil of our level, but on our own we will never be able to understand how to shift from evil to good, because this transition involves a new consciousness and new qualities on our part. That is why Kabbalah is being revealed today, as it is the science about revealing our next level. 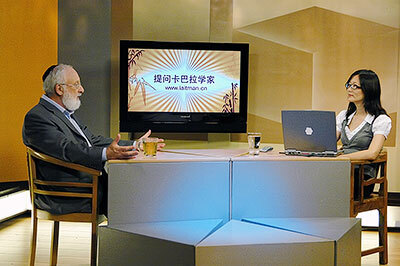 We recently filmed the first episodes of the program “Ask the Kabbalist” in Chinese. More and more Chinese speaking people are studying with the Bnei Baruch Kabbalah Education and Research Institute, and many Chinese people also study in English, especially those living in North America. Thank you to the many people who have also made it possible to have both this blog and our website translated into Chinese. A question I received: Are you the Messiah? Since no one besides you can explain what’s happening in reality so accurately and wisely, and everything you say is true, this is the conclusion that comes to mind. Who or what is the Messiah according to Kabbalah: an object, an individual, an animal, or an action? My Answer: The Messiah is the Force of the Creator which pulls us out of our current, limited perception, when we feel only this part of the world, and into the full sensation of the world. Messiah comes from the verb Lishmoh – to pull out. Laitman.com Post: Am I A Mystic Or A Prophet?